There are a lot of ways to shoot the night sky, and sure the location is the biggest thing to tick off, the further away from city lights and light pollution is a must. 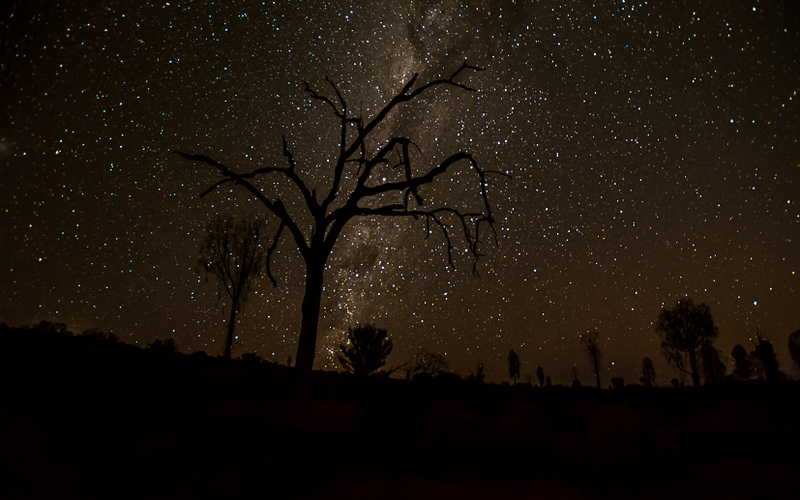 I was spoiled at Ayers Rock recently for clear skies, no moon and no clouds. No light or air pollution at all. So once you have established a location, ask yourself if there is any thing or feature to add to the image, dead trees, live trees, buildings, old cars etc etc. Make sure there is no moon (unless you are trying to shoot the moon). Get yourself an App like StarTracker for Android to see the night sky and position of various elements like the Milky Way. I managed to catch a shooting light trail; a plane, space junk or a star? Make sure you wear suitable clothing, winter time is usually the best time for photos, as the skies are usually clearer, but of course that usually means it gets very cold. Warm jackets, gloves, woollen beanies or hats, scarves and thick warm socks are a must. Make sure you wear good sturdy shoes as you maybe walking over rough terrain in the dark. A good head lamp is a must, a torch is OK, however juggling tripod, camera, gear, backpacks etc and a torch is tricky, I’ve done it before. A good head lamp that can dim as well as be red and has an emergency beacon is a good idea too. In saying that, don’t dump the torch completely they can be great for lighting up subjects in the fore ground; trees, buildings, cars etc. Next is tripod, you just can’t shoot without a tripod, there is no way you can hand hold a camera steady for 20 – 25 seconds. You can use tables, rocks the ground or various other things, but you can’t beat a tripod. We have a really cool Manfrotto 190L which you can extend and pull out the centre pole and lay it back horizontally so you can shoot the camera directly up at the sky. A remote (I have a basic corded remote, there are some fancy ones out there with timers and are wireless etc, I now think I want one of these!). Of course the camera is kind of important too. Now with the camera, it needs a manual mode, preferably with a bulb mode, if your camera has Noise Reduction, or long exposure NR turn this on, it makes a huge difference to post production. I have seen people attempt night shoots with smart phone, sorry folks it just isn’t going to cut it! Wait until at least 2-3 hours after sunset to avoid the after glow (Unless you like and want the red/orange glow in the foreground or bottom of the image – it can be really cool too). Pick your spot and try a few 10 send shots as a test. Once you are happy with the composition, you can finish setting up. Run f-stop as large (smaller the number the larger the aperture) as you can, say f/2.8 – 3.5, then set your ISO…depending on how dark, perhaps 3200 or 6400. If you camera has night shoot Hi3 or Hi5 you can try these as well (these require shorter exposure time, say 10 seconds). Set you focus to infinity and try a couple of test shots again. Patience is key. 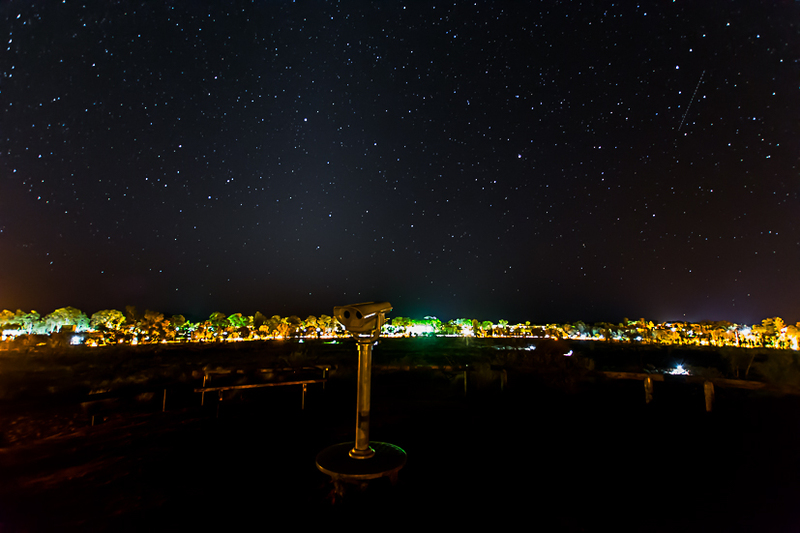 Don’t shoot any longer than 20 – 25 seconds or you will get movement of the stars, mostly blurred. Star trails on the other hand are different again, but I won’t go into it in this post. If you have a secondary subject in your shot, try illumination with a low wattage torch, just for a split second… It’s amazing what a difference it can make. Even try different colors…..see my post on light painting. Now once taken, you can import images into Photoshop or Lightroom (Or any other program of your choosing), and you can adjust exposure, increase luminosity, adjust blacks as required. One of my cameras is often a little too red, so I drop the amount of red…..all until I am happy with the result. These are single shots SOOC (Straight out of Camera), I don’t stack my images, I don’t blend my images, just good images. Some feel you should use a grey card and a white card, but I have never done it, to be honest I keep forgetting. Other’s also feel that it is necessary to stack shots, but I have honestly never felt the need, a really good exposure and composition and the sky will speak for itself in the right conditions. 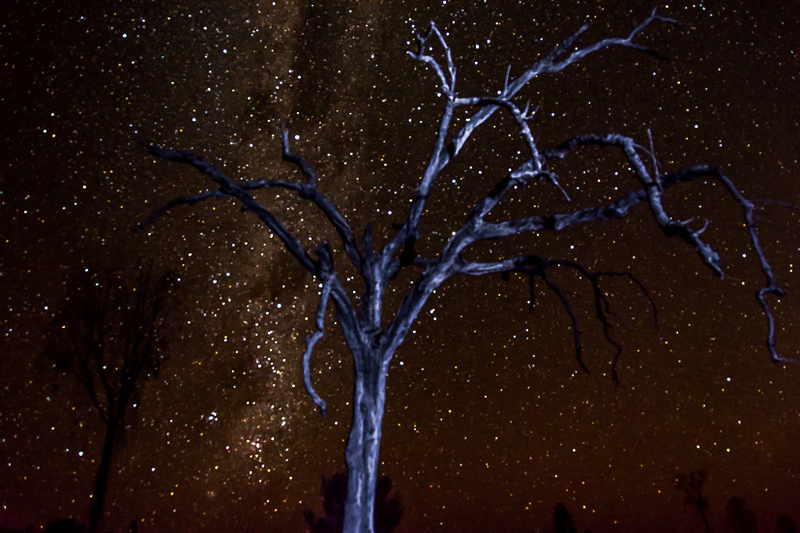 That’s it…..the sky is the star, dead trees etc. can add character, but it’s all in the set-up. So go out there and have some fun, don’t be afraid to experiment. Beautiful Julie! I’d love to do this, but where I love it’s impossible. I’d have to drive hours away to do this. Love the shots. Night shooting baffles me. I really need to practice more. I have no excuse as I live in the country and can go into my backyard and have a perfect night sky. That’s my problem! I over think! I need one of those remote control thingies so I can be 30 meters away and not keep fiddling. How cold is it down there now? You must be in the middle of winter if I’m not mistaken. Oh that’s nothing compared to here in Canada. That’s our spring and fall weather. Oh I’ll be shopping around for days! By the by, have you seen my horse blog? i am not sure……….what is the link? Great shots and post. The torch is a good idea. Oh MY GOSH! Fantastic!!!! I want to learn from you…. Marvelous!